Anticipation for a big order from Qatar is growing among the South Korean shipbuilders that have been in a slump. 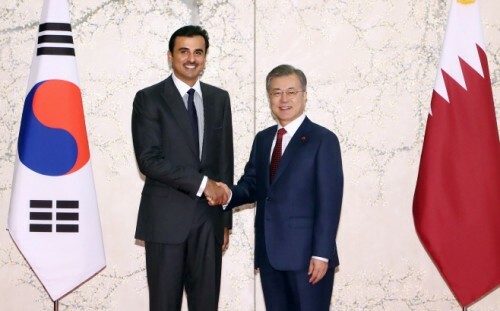 Qatar outlined plans to order 60 new liquefied natural gas (LNG) carriers, during a bilateral summit on Monday between South Korean President Moon Jae-in and Qatar Emir Sheikh Tamim bin Hamad Al Thani. The plan indicates that Qatar is actually willing to place new orders to South Korean shipbuilders. According to Cheong Wa Dae, Qatar’s Energy Minister Saad Sherida Al-Kaabi said that a Qatar delegation has visited South Korea as part of research to implement a plan to increase the number of its LNG carriers to 110 from 50. “South Korea has a lot of experience in shipbuilding and has a reputation for its technological prowess. So we look forward to a good cooperative relationship with Seoul on buying LNG carriers,” the Qatari energy minister said. Industry observers say that chances are very high Qatar would place new orders to South Korean shipbuilders. Speaking during a luncheon after the summit, Daewoo Shipbuilding and Marine Engineering (DSME) CEO Jung Sung-leep said that among 50 LNG carriers owned by Qatar, most of them were built by Korea’s top three shipbuilders and that South Korean shipbuilders would be considered the most-preferred candidates to win the upcoming 60 new ship orders. In fact, the three shipbuilders, including DSME, Hyundai Heavy Industries, and Samsung Heavy Industries, have won the 45 LNG carriers ordered by Qatar from 2004 to 2007. The two leaders agreed to expand cooperation in the areas of transportation infrastructure on land and on the sea to ensure Qatar’s successful hosting of the 2022 World Cup, the first in the Middle East. In particular, President Moon said that South Korean companies are willing to participate in Qatar’s compressed natural gas (CNG) fuelling station project as the Middle Eastern country is planning to introduce CNG buses for the 2020 World Cup. Moon added that his country will share its experience in hosting big international sports events and support Qatar for the successful hosting of the 2022 World Cup. He also asked for cooperation with Qatar so that South Korean companies can participate in large-scale projects, such as Hamad International Airport and Hamad Port Expansion Projects and Doha Metro’s Green Line Extension Project.